Hello, friends! I have something new to share. People who know me know that I'm a tea drinker. I don't like regular coffee. I tried it ages ago, but it didn't hit the spot. Once in a while, I might drink a fu-fu coffeehouse drink made with espresso and lots of milk and flavorings. So rewind back to last April, when I was pregnant with Natalie. I have no explanation for this, but I suddenly loved coffee. I would wake up at night dreaming of lattes. I'd fix myself an afternoon treat with the Keurig machine and doctor it with cocoa mix and lots of cream. My husband likes espresso and we'd talked for years about getting an espresso machine. It just happened to be a really low priority since I've been a tea person and not an espresso person. Suddenly it made sense to me to get the espresso machine for his birthday so I could also have it to satisfy my cravings. Isn't that how marriage works? I got one of the Nespresso Lattissima+ machines. It's been really easy to use and makes a good drink for pod-lovers like me. I've been experimenting with the shots of espresso, the foamy milk, the flavored syrups, and combining them in different ways to make really good drinks. I got some of the limited edition holiday flavors and they were fantastic. Vanilla Amaretto was the best! 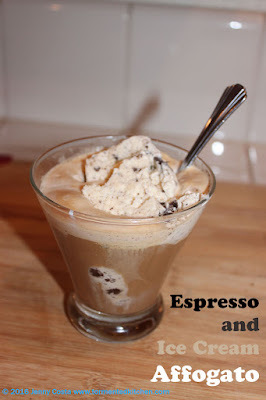 Then, I got the bright idea to try this Italian dessert that is simply ice cream with espresso. I went a bit crazy. I had two shots of Caramelito espresso with hazelnut syrup over a big scoop of Cookies and Cream ice cream before bed. You know I didn't sleep that night, but it was really, really good! 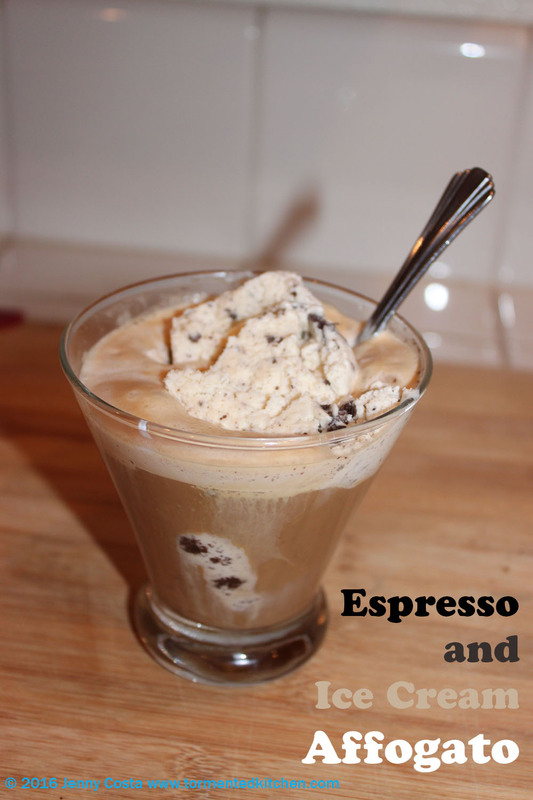 You can make affogato without an espresso machine. You will need some way to make espresso, maybe instant espresso, or brew some really strong regular coffee. Hot milk whipped a bit can stand in for the steamed milk if you don't have a fancy steamer. 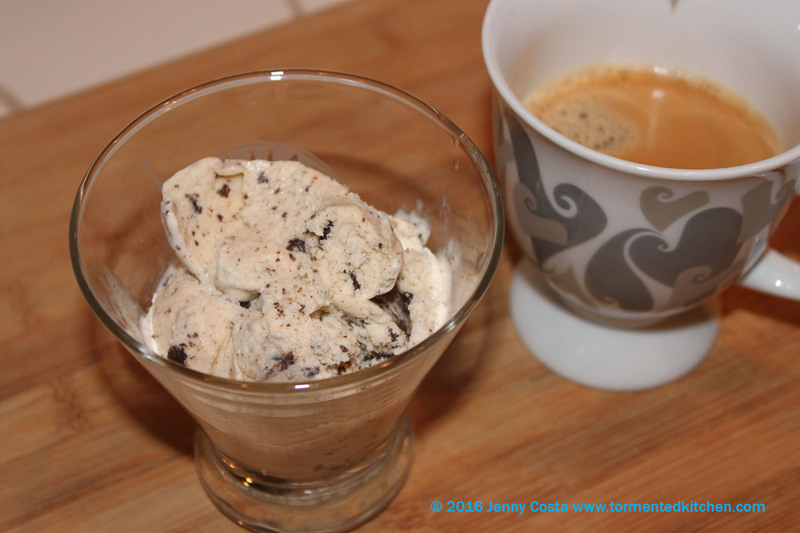 By the way, the espresso is traditionally poured over the ice cream. I'm good at doing things backwards, especially when it comes to me spilling hot espresso all over the counter and making a huge mess. Give this treat a try, although I seriously recommend having this as an afternoon treat. It's way more of a pick-up than Tiramisu. 1. Place syrup in the bottom of a short glass. Add brewed espresso. 2. Pour the foamy milk on top of the espresso. 3. Add the scoop of ice cream. 4. Eat it with spoon to scoop up the foamy milk and ice cream, then drink the rest! 1. Place syrup in the bottom of a short mug. Add brewed espresso. 3. Place the scoop of ice cream in a serving cup. 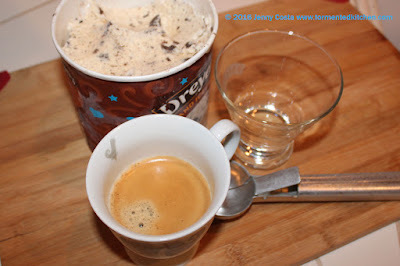 Pour espresso over the ice cream. PS. In Italian, the dessert Tiramisu literally translates to "pick-me-up." 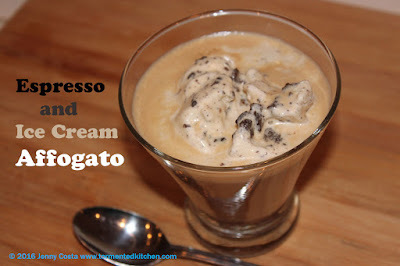 Affogato translates as "drowned" or "sunk" and is closely related to "suffocated."